Food plays second fiddle to views at this seaside restaurant, where an idyllic location is the main draw. 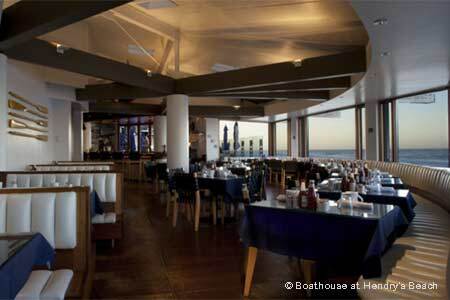 : With the ocean nipping at its patio and not another building, much less another restaurant, for miles, the Boathouse should be one of Santa Barbara’s go-to spots for seafood. Unfortunately, the food doesn’t live up to the location. Local fish such as halibut is your safest option, but the flavor may be lost in a sea of garlic butter, or in the case of local white sea bass, a roasted tomato beurre blanc. Ironically, the most reliable dishes at this seaside eatery are terrestrial: the pulled pork sliders are sweet and flavorful, dressed with caramelized onions and shaved Gouda; classic American breakfasts, such as fluffy waffles, corn beef hash and buttermilk biscuits in homemade gravy, make mornings on the patio even more pleasant. And without question, this is one of the most pleasant locations in a postcard city. Sunday brunch is particularly popular. Servers come and go with each passing quarter at the local colleges, so avoid rush hours or be prepared to linger. A full bar and specialty cocktails like blood-orange margaritas and honeycomb mojitos (the honeycomb simple syrup gives those minty sour flavors a nice kick) make long waits seem like a vacation.